This flat (ground, first and second floor) used to be a dovecote until it was transformed into a romantic little tower with a wonderful view. Just like the other five flats on the grounds, this flat has been beautifully renovated. Take a dip in the shared pool, or relax with a cool drink at the covered terrace. The heated water allows you to go swimming in spring and autumn too! The flat has all the luxuries (a/c) needed for relaxation after a day of sightseeing. Do not forget to explore the area! 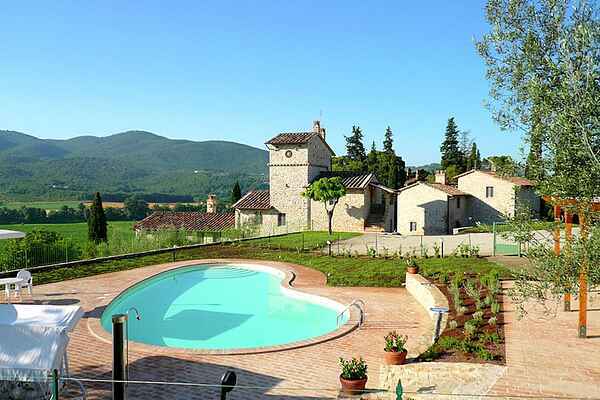 Borgo Sanvico is 6 km from Mantignana; a beautiful village in the green heart of Umbria. Perugia, the capital of this province, is only 13 km away. In this student city you will be impressed by the delicious chocolate and nice shops and bars. There is also something for kids to do. Perugia is home to the 'La Citta della Domenica' amusement park. Would you like to do something active? Lake Trasimeno (20 km) offers numerous options. So you can swim, enjoy the sun and take a boat trip on the lake. Take a day pass and explore the nicest spots by boat.